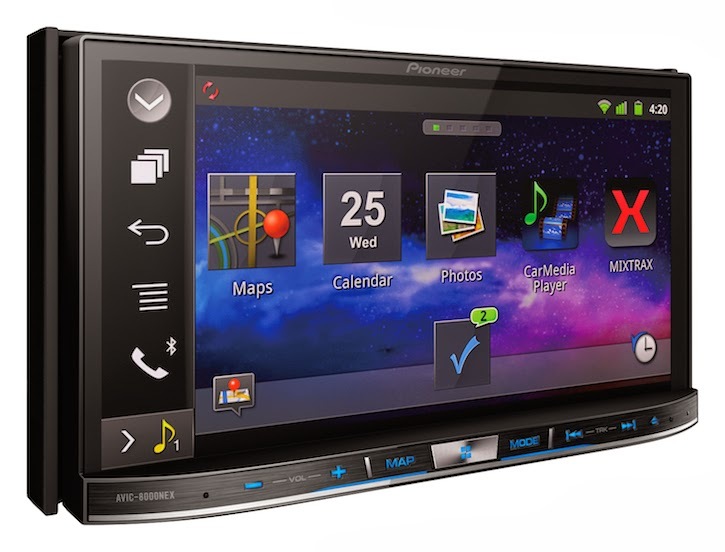 In an email to their newsletter subscribers today, Pioneer Electronics announced availability of their 2014 line of head units for purchase. The new range of products are called NEX in-dash receivers. NEX stands for Networked Entertainment eXperience. Five new NEX models will be available for purchase from Pioneer and other US retailers. More details on these NEX head units including a video from CES 2014 are below. Information on where to buy these head units at the best prices is also included. - Entirely New User Interface: Features a responsive, powerful and intuitive touchscreen user interface that is easy to use and highly customizable. - Robust Built-in Navigation: Over-the-air traffic information with turn-by-turn directions to 7.9 million POIs. - AppRadio Mode: Access compatible 3rd party apps, including music, location-based services, and maps on your iPhone or Android device. - AVICSYNC Networked Navigation: Access connected services that include traffic, local search, weather, gas prices and more. - iDatalink Maestro: Enables OEM system features integration. - MirrorLink: Access certain music and map applications on compatible MirrorLink device. - Expanded Bluetooth Capability: AVRCP 1.4 to enable browsing of your media library and HFP 1.6 with wideband audio. - Siri Eyes Free: Access many of iPhone functions using Siri. - Pandora Station Creation: Quickly create new Pandora stations. 1. Best Buy: Best Buy's website only lists the AVIC-5000NEX for sale for $799.99. This is $50 over the suggested retail price from Pioneer. The head unit is not available for purchase at the time of this posting. The status says "Coming Soon". Other receivers are not listed yet. 2. Crutchfield: Crutchfield lists all models as available for shipping on 3/31/2014. Prices are the same as those suggested by Pioneer except the AVIC-5000NEX which is listed at $679.99 after a $70 discount. Availability is limited at the moment with new stock becoming available on a daily basis. For full details visit Pioneer Electronics' website. Interesting video. Other than built-in navigation on 5000 and up units, any idea what additional functionality these units offer over AppRadio 3?